In the modern day, the printed 'Communion Card' has superseded the Communion Token, and even that is now almost a thing of the past. Both have been used as a way of ensuring that 'only those shall be admitted to the Sacrament of the Lord's Supper who have been found qualified and entitled to receive it'. 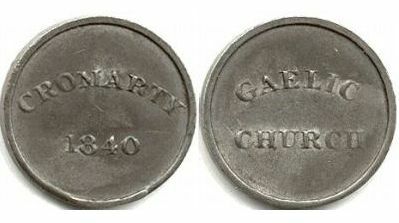 This token was issued by the then Minister of the Gaelic Church John Mackenzie in 1840.